In my last post I experimented with some pearl embossing powders from Wow! I loved the look on dark paper, but didn’t like my first try with the powders on light card stock. I decided the powders needed some color in order to shine, so I stamped with various dark colors of ink (all Clearsnap ColorBox pigments). The flowers are from an old Hero Arts set, and as you can see, I didn’t stamp cleanly. But I love the way the colors came out. I will probably cut these out or cover the boo-boos somehow … but I’ll use them, by golly! I stamped first with Clearsnap ColorBox Abyss (a deep blue) pigment ink then added various Wow! pearl powders: white, green, red, violet. I used ColorBox pigment inks that matched the pearl powders: Turtle for the green powder, Cupid for the red powder, Abyss for the blue powder. Before mounting the panel on my moss green card, I edged it in black permanent marker. Rhinestones and a sentiment (old Hero Arts set — do ya think I need some newer stamps???) finished the look. Thanks for coming along, and thanks to Wow! for letting me play with some pearl powders. I’m taking a brief break from CHA reporting to delve into Valentine’s Day! This is probably my favorite card making holiday. (Last year I sent 40 Valentines, each one just a bit different) to my best gal buddies. So easy! I die cut the heart (Hero Arts) three times from white card stock, glued the three together and embossed the top with WOW! gold glitter powder. I built my card base (using some older card stock from Stampin’ Up!) and affixed the heart on top. The banner was stamped (old Hero Arts sentiment) on white scrap paper, trimmed, and affixed with thin foam squares. Easy peasy! 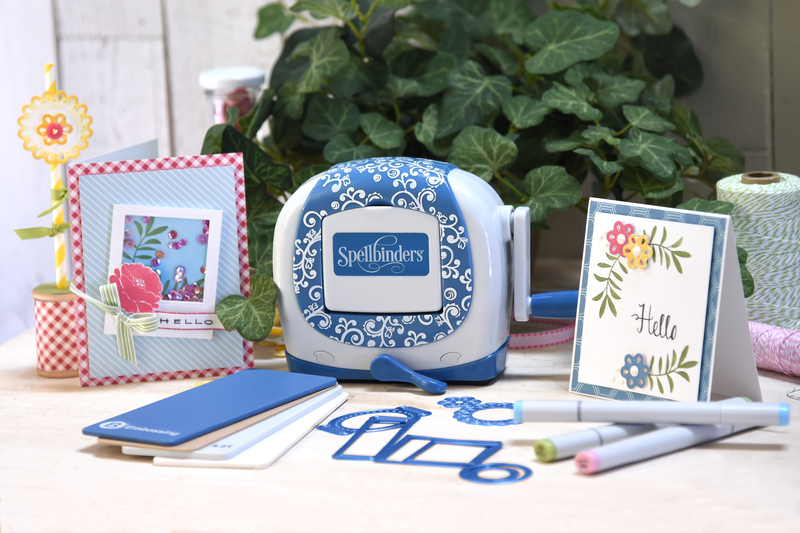 There are several Fabulous Finds in the craft world today, including two new die cutting/embossing machines from Spellbinders. 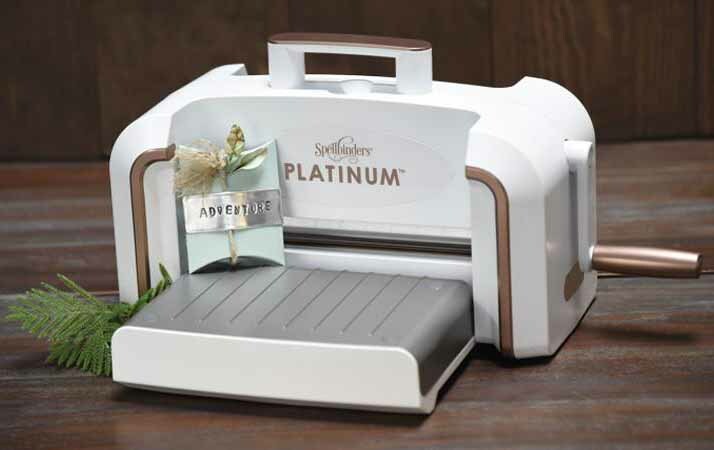 First up is the Sapphire, a small, portable manual die cutting/embossing machine aimed at beginners who want to try die cutting but don’t have the budget or the space to invest in larger machines. It handles dies up to 2 1/4 inches wide. There are also some new blue dies designed for this machine, although other dies will also work. It is sold at JoAnn fabric stores. It weighs a sturdy 14.7 pounds and has an 8.5 inch cutting base, which folds up for storage. 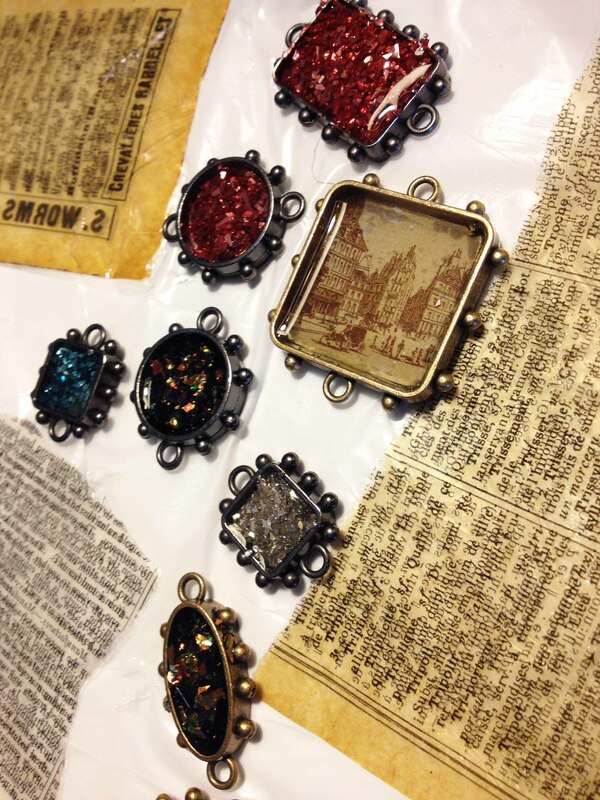 Spellbinders is also introducing 16 steel rule dies. The machine will be available in September with a MSRP of $199.99. To find out more about the Platinum, check out this video. There will be new techniques, too, and a “Weekend Workshop” feature. In other crafty news …. Stay tuned for more Fabulous Finds, sure to get you through the summer doldrums! Happy New Year everyone, and here’s hoping that 2015 is a year of health and happiness. Since I had a day off, I created a few New Year cards. Enjoy. 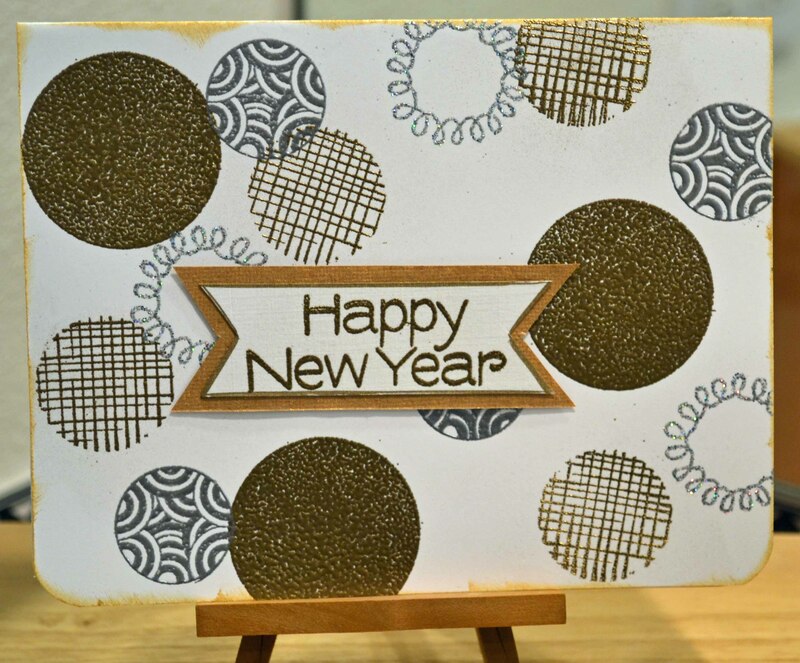 I love this card for several reasons: first, it was so fast and easy to make! And second, I found a small stash of previously dry embossed card stock pieces that I had put away! 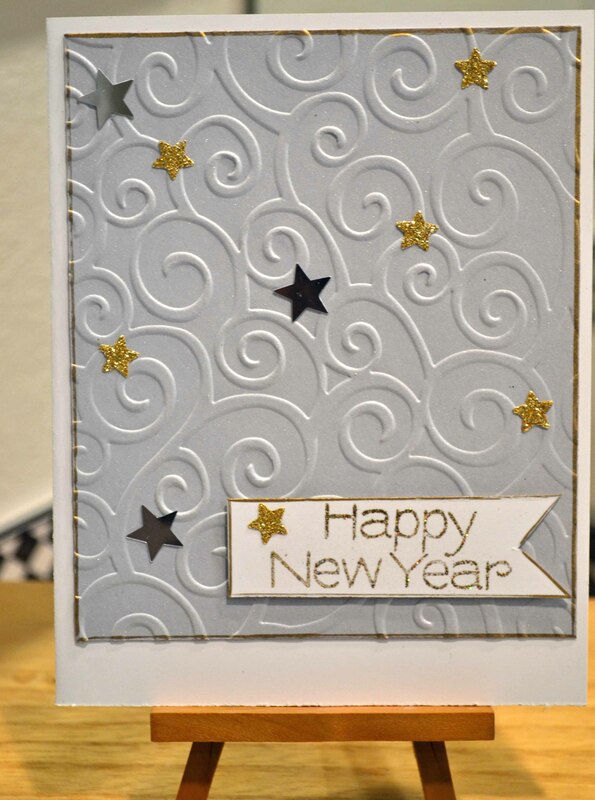 The silver embossed background was made using a Cuttlebug swirl folder. I simply cut it to size to fit the card front, edged it with a gold metallic marker, and glued it on the card. The greeting (Hero Arts Celebrate Everyday set) was embossed in gold, trimmed, and edged with the gold metallic pen. Silver sequin stars (Sulyn) and gold glitter stars (die cut using the set from Lawn Fawn’s Stitched Journaling die) were added using Ranger’s Glossy Accents. That’s it! This was inspired by a New Year’s Eve ad I saw in a magazine a while ago. Also, super easy — I used a variety of circle stamps (all from Hero Arts in various sets) and embossed some in gold, some in silver (including Judikins Aegean Silver, which has a lot of sparkle). The sentiment was trimmed and layered over a scrap of gold paper, cut to the same proportions. This was also fun. 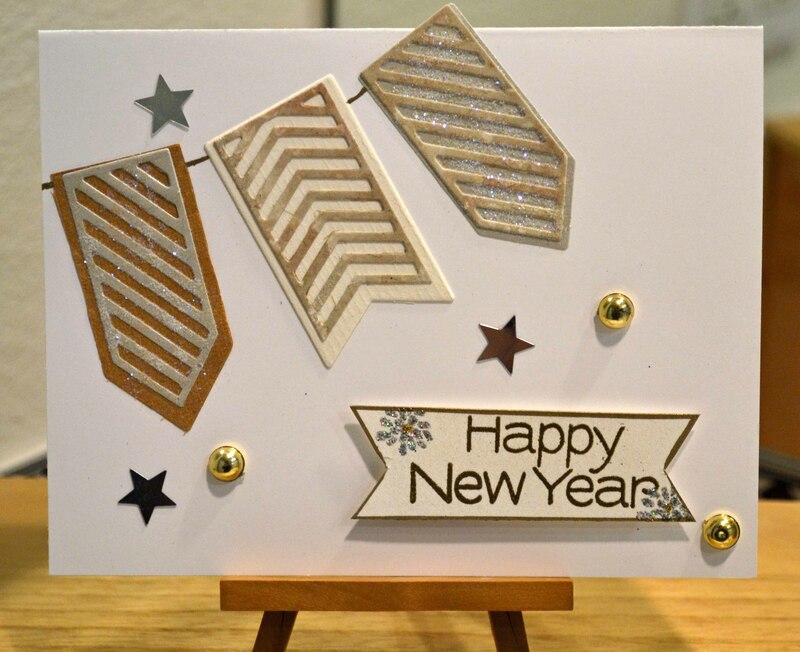 Using Sizzix’s Banner Triplets by Stephanie Bernard and some gold, silver and off-white scraps, I die cut my way to the New Year. When I glued the cut out pieces to the layering banner, some glue seeped out. At first i despaired, but then I added some ultra fine glitter and, hey, it’s not so bad. Same sentiment, but I added a little stamped and embossed bit for extra flavor. The silver Dew Drops (Robins Nest) and sequin stars (Sulyn) added the finishing touches. Thanks for stopping by! And here’s to a great year!